A Philadelphia court awarded $2.5 million to a man who grew 46DD breasts while taking the drug Risperdal. 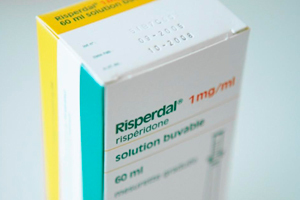 Risperdal is made by Janssen Pharmaceuticals, a Johnson & Johnson subsidiary. Gynecomastia, enlargement of breast tissue in males, was an adverse effect of using the antipsychotic drug. A Philadelphia jury found the company guilty of downplaying and hiding risks associated with the anti-psychotic drug. Austin Pledger, 20, of Thorsby, Alabama, began taking the anti-psychotic drug when he was eight years old. Although gynecomastia is non-cancerous, the growth of male breasts can cause severe embarrassment and lasting psycho-social harm. Surgery is often necessary to cure gynecomastia. Liposuction procedures may be effective for mild or moderate cases. However, severe cases of gynecomastia usually require breast-reduction surgery or a complete mastectomy – removing the breast tissue and the excess skin of the breast. J&J has been quietly settling the Risperdal breast growth claims for years. However, the number of cases has continued to grow as more families find out that there may be an association between gynecomastia and Risperdal use as a child. At the Edwards Law Firm our personal injury lawyers believe deeply that everyone deserves representation if they have been harmed by the use of a defective drug. Call right away if you feel that you or someone you love is a victim of a defective medication such as Risperdal. We do not collect any upfront costs for our services. You pay no fees unless we succeed in obtaining a settlement for you through the drug company, mediation or a jury trial. Our goal is to provide you with superior legal help using top medical experts to hold the drug companies responsible on your behalf.